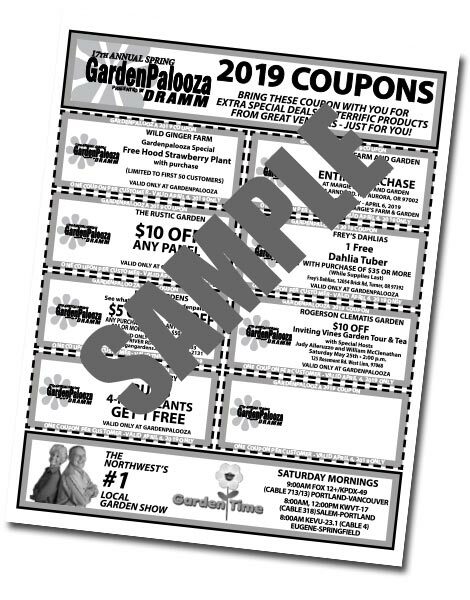 GardenPalooza with this year's coupon pages! What could be better than having over 40 vendors selling your favorite plants, garden supplies and garden art all in one place? Pages of coupons, so you can save even more money! Our GardenPalooza vendors have created some super-special deals just for you, and we've put them on printable coupon pages that you can bring to the event. You print, you save! PRINTING PDFS: If the entire sheet is not showing up on your printed page, from the PRINT screen, you should select "MORE SETTINGS" and click on the box that reads: Scale - Fit to Page. This will shrink the page to fit your specific printer. *PLEASE NOTE THAT A DOCUMENT-SAVING ERROR CAUSED AN EARLIER VERSION OF THE "ALL PAGES" PDF TO INCLUDE COUPONS FROM A PREVIOUS YEAR. ONLY THE FIRST 3 PAGES OF THE DOCUMENT CONTAIN CURRENT COUPONS. IF YOU PRINTED THE "ALL PAGES" DOCUMENT, PLEASE DISCARD ALL BUT THE FIRST THREE PAGES. THE SEPARATE PAGES 1-3 OF THE PDF AND ALL THE JPG PAGES WERE/ARE CORRECT. ALL PAGES FOR THE CURRENT YEAR HAVE A "2019 COUPONS" BANNER AT THE TOP. WE APOLOGIZE FOR THIS ERROR. We will be adding more coupons as our vendors send them to us. Please check back before GardenPalooza to get all the coupons available for this year's event.